Printmaker Ruth Hogan talks about white-line color woodcut techniques as practiced by Cleveland artist Mabel Hewit in this video from Cleveland Museum of Art. 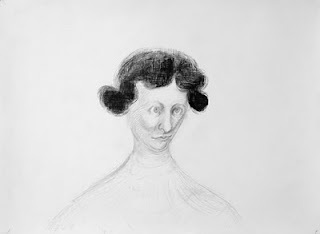 The exhibit of Mabel Hewit's work is on view now through October 24, 2010. Click here for an article about the show with more background about Hewit's life. The conference will gather professional print artists, art educators and scholars in the field of woodblock printmaking to exchange current research information and experiences with Japanese traditional craftsmen, printmakers and print related art suppliers and toolmakers. The conference will move between two locations, Kyoto and Awaji island (where the “Nagasawa Art Park Japanese Printmaking Program” takes place). 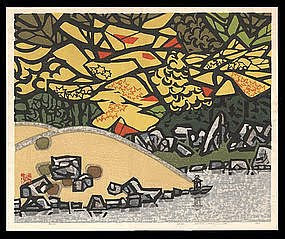 In Kyoto there will be workshops, demonstrations and moku hanga exhibitions. The second half of the conference in Awaji will focus on lectures, panel discussions, presentations and exchanges with colleagues. An email I received this morning notes that from now until December 18 applications are being accepted for a juried woodblock print exhibition of prints made in the waterbased moku hanga tradition or with contemporary materials that reflect moku hanga principles. There are PDF entry guidelines here. I really hope I can go to this conference! It's an interesting experience to complete a body of work and then discover that another artist has covered the same material. I've identified five stages of response (take that, Elizabeth Kubler Ross!). My first-stage reaction always includes a tinge of panic (did one of us copy the other? ), followed by some Google investigation, then a stage of comparing (hers is so much better than mine), some deep thinking, and finally delight. I had an opportunity to observe these stages in action a couple of weeks ago when Ed Winkleman announced the Winkleman Gallery show of Sarah Peters' Appeal to Heaven, which includes a set of drawings called "The Mayflower Series." Peters' work and my Pilgrim prints are not at all similar. Her drawings are intricate layered pen and ink crosshatchings, resembling etchings. 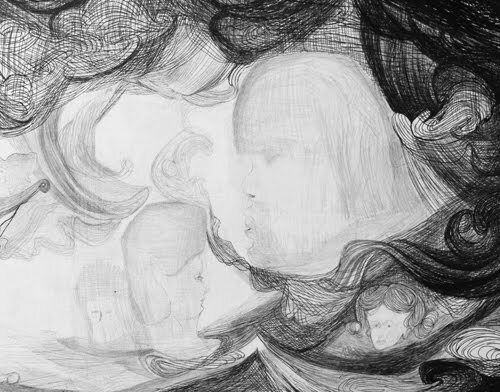 Most of her Mayflower drawings are depictions of ocean/water. I like them very much and I appreciate the thinking that I can discern behind the drawings. Peters has titled these water drawings with dates -- September 6, 1620 (the day the Mayflower left England), October 5, 1620, etc. -- taking us along on the grueling 66-day voyage. The churning waters and the occasional emerging human faces in the waves convey the terror that must have consumed the passengers' lives during their 66 days at sea and from what I can see on the Winkleman web site, Peters' strong assertive mark making could make one a little seasick up close. It's an effective approach, and very different from mine. But what struck me immediately is that we both gravitated toward the story of Dorothy May Bradford. At the top of the post you can see Peters' portrait of Dorothy (the only portrait in her series), and mine to the right. My deepest feeling about this co-incidence? I'm touched by the fact that both of us were touched by Dorothy's story. Dorothy's story is tragic, intriguing, mysterious, deeply sad, and I think highly resonant for a woman artist. I feel affirmed by seeing Peters' work. And delighted. that when a culture is in crisis, the first response is often to go back to the creation myth to start over again. I don't know if Sarah Peters is a Mayflower descendant too (I assume that she is), but that act of reaching back to the American creation myth is the common thread I see in our work. We're each doing it in a different way, not just in terms of our medium of choice and our styles, but also in the audiences we each seem to be speaking to. But our questions appear to be the same. When I see that another artist is asking the same questions that I am, it makes me feel that rather than toiling away in my own little world I'm a participant in a larger dialog. Sarah Peters' show at Winkleman Gallery looks fantastic, and if I lived in NY I would have spent the evening at the opening last night. The show is up through October 9, 2010. Leave me a comment here if you see it in person -- I'd love to hear your impressions. This tidbit came to me yesterday through Beth Cullom on Twitter (via Tokyo-based web site Pink Tentacle). The University of California San Francisco has an online gallery of 400 woodblock prints on health-related themes. Very intriguing images for me, given how I love all that sciency-stuff in my art. A lot of the pieces, 80 in all, deal with the treatment and prevention of three contagious diseases -- smallpox, measles and cholera. 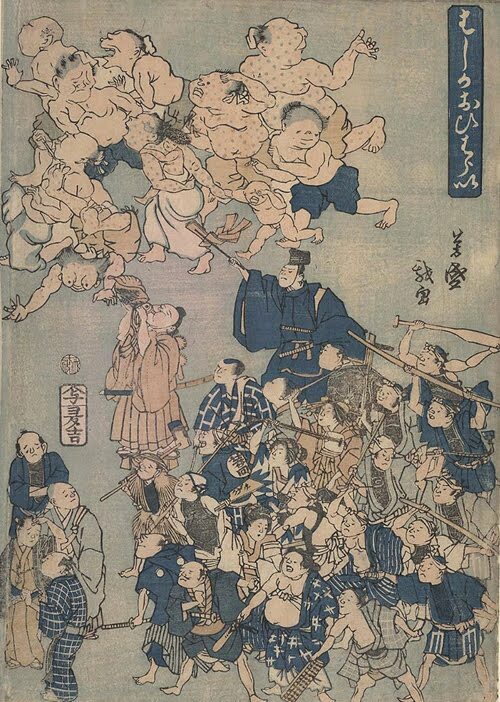 A number of these types of prints show Buddhist or Shinto dieties intervening to prevent or cure the disease, such as the one below which is described as a talisman to ward off smallpox. There are three or four of these smallpox prints in the collection, all executed in red ink. The red ink gave me a little chill, because when I created my Ten Little Nine Little Indians print about smallpox I used red to make the smallpox virus that "wraps" the Indian. 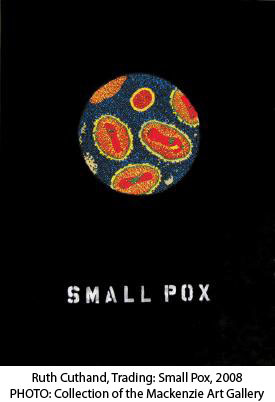 There must be something red about smallpox. 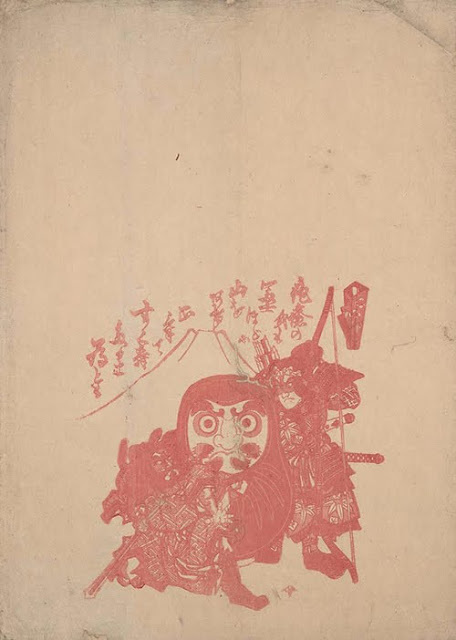 But then again, maybe there's just something red about the deity called Daruma. A number of the prints also contain maps and depictions of foreigners because foreigners were thought to be carriers of disease. This is indeed sometimes the case, as happened in Colonial America when the native peoples were decimated by European diseases. At any rate, I wouldn't mind having a fierce Daruma to protect me from disease. It's Labor Day in New England, the day that we typically think of as the end of summer even though technically it isn't. The nights are cool, some of the leaves are gaining a rosy hew, the thousands of college students that live here in this valley are returning, and I find myself evaluating my life and my projects as I always do at this time of year, noticing the projects I didn't begin or complete and figuring out the ones I want to commit to before the end of the year. So I want to reassure you that I will still be making woodblock prints and I will still be recording my process. But at this point in my development, I find myself also becoming interested in other art forms, interested in learning about the broader so-called art world, and interested in the artistic process in and of itself -- what it means to be not just a printmaker, but an artist. For those of you blog readers who come here from the Baren Forum discussion list, what this means is that you will see only the posts that are about and are tagged "woodblock." If you would like to see and participate in the other posts as well, I'd suggest that you "follow" the blog by clicking the "Follow" button at the bottom of the right-hand column. No matter how often you visit, and however you arrive here, thank you as always for following along with Woodblock Dreams.